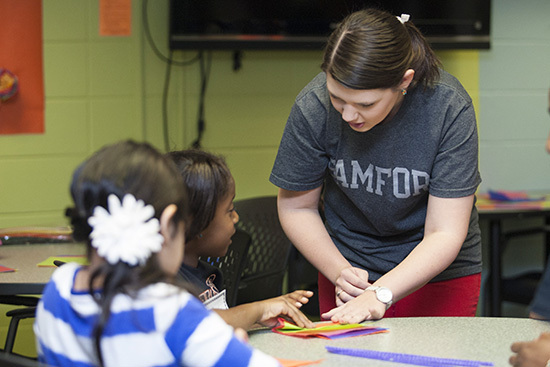 More than 100 third grade students and teachers from Trace Crossings Elementary School in Hoover, Ala., visited Samford University April 2 to participate in the annual John and Frances Carter Young Authors Conference. The event was hosted by teacher education students from Samford's Orlean Bullard Beeson School of Education and Birmingham's Miles College. The goal of the day was to increase diversity appreciation through children's literature. Students rotated through various literature stations, participating in book talks and follow-up activities including a reader's theatre, creative drawing and character analyses. The day's activities closed with students hearing from Rick Shelton, a local author and storyteller, who spoke about a new book he is writing. He also spent some time giving advice to the children on how to enhance their writing. Michele Haralson, event coordinator and director of the education curriculum materials and technology center, said the event is beneficial to all those who participate. "Every year the main focus of the conference is for elementary students to enhance their appreciation for literature and writing; however, at the same time, our candidates are learning how to be educators," Haralson said. "This event also strengthens our continued partnerships with Miles College and Trace Crossings." Teacher education candidates spend significant amounts of time in Trace Crossings classrooms as part of a K-12 school-university partnership. The partnership allows candidates to become immersed in the elementary school culture. The conference is named for Drs. John and Frances Carter who taught for many years in the education school. Over the years, the Carters supported education programs by funding scholarships and sponsoring the conference. John Carter, who was on faculty for 31 years and served as dean six years of those years, died March 2.